Singapore today, notwithstanding its diminutive size, is experiencing drastic growth, particularly in terms of the economy and property development. It is therefore not surprising to learn that there are myriads of expensive and luxury homes in the country. Singapore has been home to some of the most expensive houses in the world lately. Foreign business tycoons from different parts of the globe, as well as local billionaires, are determined to spend on extravagant properties, especially in the prime locations of Singapore. If you’re also interested in finding out, here’s a list of the top most expensive houses in Singapore, which could be of great value to you. The late Tan Tock Seng, a famous philanthropist, owned a good class bungalow at 9 Cuscaden Road. His descendants sold the property for $145,000,000 to Shun Tak Holdings. The company is owned by a popular gambling billionaire Stanley Ho. This freehold site spans over 25,742sqft and it’s actually a hotel-zoned area but could be converted to a residential development as well. Firmly rooted in the tourism industry in Macau, Shun Tak would’ve preferred the property to be used as a hotel. Even today, in 2018, the house is considered as the most expensive property in Singapore and continues to enjoy great value. The Tanjong Pagar Centre, which is one of Singapore’s tallest buildings, is located at the heart of the Central Business District, developed by GuocoLand. The 62nd to 64th floor of this Wallich Residence comprise an amazing ‘super penthouse” where spectacular architecture and amazing furnishings make for a luxury living experience. To date, this is the largest non-landed property in Singapore, providing an area of 21,000sqft with 5 bedrooms, 6 full bathrooms and 3 partial bathrooms. This stunning residence features an exclusive cabana, entertainment room, swimming pool, bar facilities and Jacuzzi room. Residents can fully benefit from the experience of luxurious living at a price of S$108mn. This $93.9 million good class bungalow in 81 Dalvey Road is owned by Lim Kim San, the first chairman of Housing and Development’s Board (HDB). The expensive price tag of this freehold property is explained by a large land area of 52,059sqft and elevated grounds, along with its location near to the Singapore Botanic Garden. Additionally, Dalvey Road has been home to prestigious individuals in Singapore, as well as foreign ambassadors and commissioners. Among the 39 gazetted zones for GCBs, this property is considered one of the most prized within the area of White House Park. Due to its spacious land area, the property can be subdivided into two bigger GCBs or three smaller bungalow plots. Fetching a price tag of $65 million, the two good class bungalows built on 32,478sqft land area make for an exemplary investment opportunity for rich individuals. Under the 2014 Master Plan, the property is zoned under residential and the price tag of combined GCBs is appropriate for instant redevelopment or occupation. The property is in close proximity to dining and entertainment destinations like Holland Village and Dempsey Hill as well as the Singapore Botanic Garden. A prominent good class bungalow sprawling over 73,277sqft land area is located at 35 Ridout Road in District 10 and it is priced at $91,000,000. Apart from a 2–storey bungalow within the area, a wide open field and two single-storey outhouses are also available. With a larger area, this could be subdivided into four smaller GCB plots, averaging to 18,300 for each plot. The distinct location within the GCBs area in the district 10 makes this property close to entertainment and dining hubs at the Orchard Road, Dempsey Hill and Holland Village. It is also very close to major expressways and roads, making the property very accessible. A different taste of elegant living can be experienced in a good class bungalow at Leedon Road. This property is built on a land area of 44,000sq ft, with 4 beds and 4 bathrooms. This large plot GCB can be subdivided into two smaller GGCBs, which nowadays have become rare in the real estate market. With exquisite design, this GCB is priced at S$68,000,000. As it is a free-standing, landed property and spans over a large land area, it is noteworthy that many rich businessmen or billionaires are interested to invest in it. This property is amongst the most luxurious good class bungalows in the country and is constructed over an area of 27,000sqft. This development is priced at S$60,000,000 and is designed in two storeys with 5 bedrooms, 5 full bathrooms and 2 partial bathrooms. A contemporary re-interpretation of a British black and white colonial bungalow, the property is equipped with state of the art and most elegant specifications. The interior is designed with the highest luxury, occupying an area of 10,516sq ft while the exterior is 0.6284 acres. A swimming pool, garden patio and yard are amongst the facilities that make this property stand out. Both ultimate privacy and maximum luxury are provided in the bungalows at Pearl Island. The property is situated in a private island and each bungalow is surrounded by a shallow pool, where true romanticism can be felt. Every bungalow has a land area ranging from 6,598 to 11,270sqft. Each individual plot is linked and unified by water and offers magnificent views. Pearl Island is also known as the only waterfront community in Singapore with luxury residences amounting to S$26,322,000. 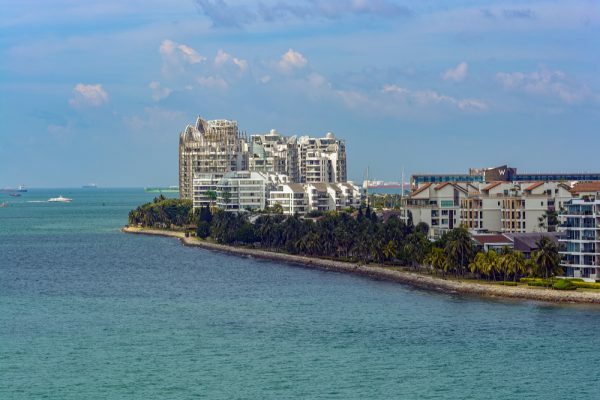 The most expensive and luxurious homes in Singapore are in high demand despite their hefty price tags, with millionaires and billionaires from across the world showing their interest in these properties. Both foreigners and permanent residents of Singapore alike are fueled to invest more on extravagant properties. Compared to other neighboring countries, Singapore is more attractive to rich people who are in search of expensive houses. So, why don’t you take the plunge and throw your cash out to buy one of these amazing properties.